'I am described as the most hated man in England’ said Keith Best, the Chair of Immigration Advisory Service UK (IASUK), referring to a BNP website as an illustration of the controversy and confusion that surrounds the immigration debate. He compared the UK where 10% of the population were born overseas to 12% in the US, 14% in France, 20% in Canada and 25% in Australia adding that none of those nations are in danger of ‘immediate social disintegration’. Yet the UK has a higher level of negativity to immigration than those other nations. (IASUK Press Release link here.) Yasmin Alibhai – Brown commented that the media had surrendered the debate to the anti – immigration lobby and that the situation was as bad as the 1960’s with both the centre left and the centre right uniting against immigration. She pushed for serious research into the effects of immigration highlighting changes in the UK since the 1960’s. Lord Parekh explored how to frame an effective discussion on immigration (full speech link). 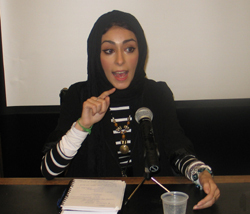 Video of Seja Majeed's talk. Lord Parekh explored how to frame an effective discussion (link) of the immigration issue targeting neither those vehemently for or against immigration but those who remained to be influenced by accurate and logical debate. He emphasised that the immigrants who came to the UK were mostly resourceful and industrious and added £3-4 bn to the UK economy and the vitality of its culture.